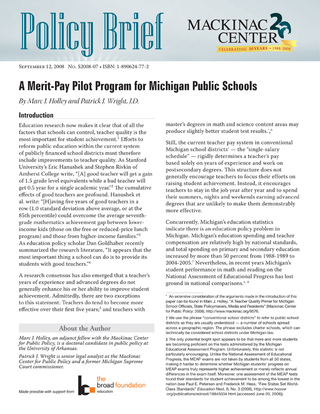 A privately financed merit-pay bonus program is feasible and potentially powerful. It could generate new and valuable data about how teachers respond to financial incentives and how much teachers are able to improve student achievement. Moreover, successful results could easily spark interest in teacher compensation reform outside a single district or charter school. Michigan residents, businesses, educators and policymakers are growing hungry for ideas that provide real grounds for hope, rather than grounds for more spending and uninspiring results. A successful program would also suggest that the rough consensus of education researchers is correct: Most of the factors leading to higher pay in a single-salary schedule do not significantly affect teacher effectiveness and student performance. The real question would then be whether districts should not examine their reliance on the single-salary schedule itself. True, reforming the single-salary schedule and removing tenure act barriers to demoting ineffective teachers would create "winners" and "losers" among Michigan’s teachers. But if the assumptions behind merit pay are correct, the teaching profession would improve, and public school monies would produce better results. In that case, Michigan’s schoolchildren would be the winners, just as they should be.